Carolina Clay - Description | W. W. Norton & Company Ltd. He is known today, as he was then, only as Dave. His pots and storage jars were everyday items, but because of their beauty and massive size, and because Dave signed and inscribed many with poems, they now fetch six figures at auction. 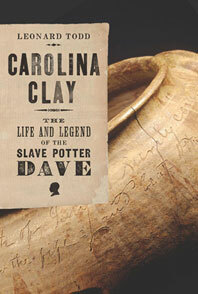 We know of no other slave artist who dared to put his name on his work, a dangerous advertisement of literacy.Fascinated by the man and by this troubling family history, Leonard Todd moved from Manhattan to Edgefield, South Carolina, where his ancestors had established a thriving pottery industry in the early 1800s. Todd studied each of Dave's poems for biographical clues, which he pieced together with local records and family letters to create this moving and dramatic chronicle of Dave's life—a story of creative triumph in the midst of slavery. Many of Dave's astounding jars are found now in America's finest museums.